The best meals come from the very best ingredients, this one started with a jar of duck fat from Charcuterie Ratinaud... I was thinking crispy potatoes. Next thing you know, my shopping bag is full of Willy Krauch's lox, Jerusalem artichokes, creme fraiche, and Yukon Gold potatoes from Pete's. I'm feeling celebratory, so for brunch I'm making latkes, cooking them in duck fat, serving them with lox. What to drink? Chris Makin, the resident sommelier advises Blomindon Estate Winery Cremant. "Blomidon Cremant is made in the same way as Champagne but using less pressure (fewer bubbles), a slightly lower alcohol level, and a silky texture which makes it a great go-to wine for brunch. 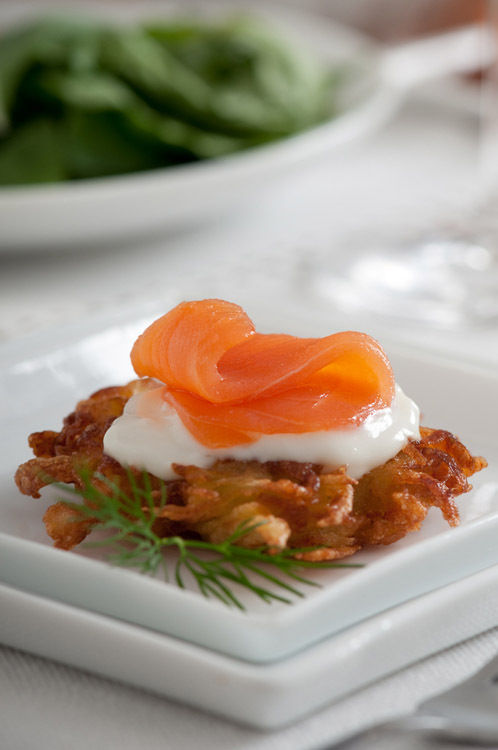 The natural acidity and citrus flavours slice clean through the richness of a smoked salmon dish and the yeastiness from the second fermentation in-bottle brings out the toasted flavours of the latkes." Using the coarse side of a box grater, grate the potato, onion, and Jerusalem artichoke undo a clean tea towel. Gather up the edges of the towel and squeeze the liquid out of the veggies over a bowl. There will be a lot of water, so shift the contents of the towel a couple of times, regather and squeeze again. In a separate bowl, mix together eggs, Panko, and baking powder. Add the veggies after they have been squeezed dry and stir to combine. Heat the duck fat over med heat and drop the potato mixture into the oil by the heaping tablespoonful. Fry until golden, gently flip and continue to cook until golden on both sides. Drain excess grease on paper towels. To serve, top with a dollop of creme fraiche and a thin slice of Willy Krauch's Smoked Salmon.